Who are those two masked men? It's Rob and Jackie laying down the mask for the Yenko stripes on our '69 Chevelle Resto-mod project. 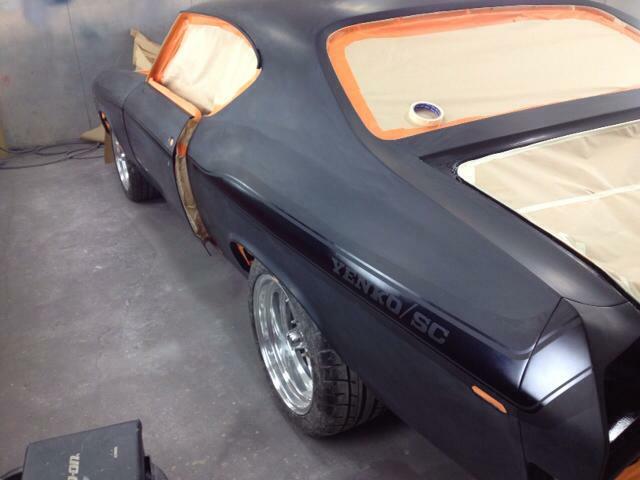 The Yenko stripe kit comes from the supplier as a decal kit (i.e. stickers). However, our customer wanted the stripes to be painted on in the form of a ghost stripe. So we had our printer scan and reverse the decals to form a mask. The masking kit was applied over the car's new black paint and then the entire car was masked. Rob then sprayed on the stripes through the exposed part of the mask. When the car was unmasked the stripes were revealed. The entire car will get a couple of coats of clear tomorrow before getting a final colour sand. The base colour for the stripes is the same black base colour used to paint the rest of the car. The only difference is that some blue pearl has been added to the base colour. The end result is a stripe that will only be seen when the sun hits the blue pearl at just the right angle. Hence the name 'ghost stripes'.